Posted on August 25, 2017 by Katrina C.
Over 15 years ago, my husband and I installed a beautiful cedar deck. That first year it looked perfect; we painstakingly added several coats of stain to protect the surface and bring out the natural wood grains and colors. However, over the years this process had to be repeated again and again, with the tedious effort of removing old stain and sanding the surface clean to start fresh. Now, a decade and a half later, despite all our hard labor, the years have taken their toll and it is time for a replacement. These days, I am much more savvy on the costs of staining, stripping and sanding, not to mention the hours of time that maintenance of real wood consumes. So this time around we are strongly considering composite decking to reduce to labor and cost later on down the road..
Composite decking has come a long way over the past several decades. In the early days of production, color quality in composite deck material was limited and did not hold up well to the natural elements. Fading and degradation were often apparent, diminishing the popularity of these building materials. But despite these initial challenges, the sustainability of composite decking technology still held promise for the future and new industry competition quickly stepped up to the plate. These manufacturers found ways to improve the plastic composite material by using advanced instrumentation to monitor color and quality throughout the production process. Today, modern composite deck companies offer a variety of products with the look and feel of their real wood alternatives. As a result, sales of composite materials have skyrocketed, with last years sales topping the $1 billion mark1. With sales continuing to grow, manufactures are looking for new ways to improve the color stability and quality of their building materials in order to stay competitive in this expanding industry. 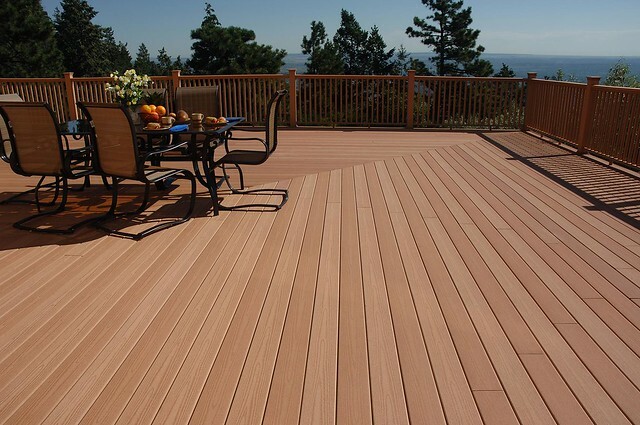 Composite decking materials are typically formed using a polymer extrusion process. During this process, materials are melted and extruded into a polymeric matrix while fibers and other additives are mixed in. Pigments, stabilizers, UV absorbers, processing aids and lubricants, bactericides, and other materials are commonly used to enhance the physical and/or chemical properties of the composite material2. Throughout these processes, color changes must be carefully monitored using spectral technology to provide critical data and feedback. 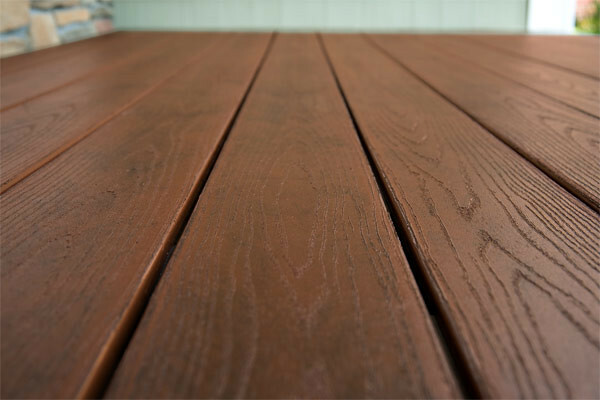 Spectrophotometers quantify the color and UV absorbency of extruded composite decking material by assigning a numerical value to each sample and storing this data for repeatability. By establishing standardized test methods, these processes can be simplified. High-volume manufacturing of extruded plastic materials requires raw materials to be melted and formed into a continuous profile which requires constant analysis. Today’s advanced spectrophotometers are designed to offer in-line process monitoring and evaluate specific color changes throughout production in order to create a set of standardized colors that can be repeated from batch to batch. With precise light source specifications and geometric principles, a quantitative matching system can be used to categorize these colors. A color tolerance system can then be applied to specific samples for repeatability and to meet customer needs. By developing a color tolerance, the margin for error is drastically reduced and manufacturers are able to make any necessary process changes as soon as out-of-spec color variation is detected. Color fading and material degradation are common problems associated with outdoor plastic materials. Research on UV-based polymer degradation has allowed manufacturers to closely monitor changes in the light spectrum and assess how variations in polymer formulations can best withstands the affects of nature. Spectrophotometers can be used to evaluate the efficacy of these new formulations and effects of UV exposure by monitoring color changes due to UV light, as well as exposure to other environmental stressors. These processes help in the development of materials that are both stronger and retain color more effectively. The color quality in composite deck material production demands tight tolerances and efficient use of materials. The ability to maintain a high level of color quality control is crucial for reducing wasted material and avoiding line shutdown and/or extensive operator involvement. HunterLab understands these challenges and provides a complete line of products for monitoring color quality and improving efficiency. HunterLab spectrophotometers have been used extensively in the plastics industry for over 60 years. Today, we specialize in helping the world’s plastics producers consistently manage the color of their products to meet quality standards. For more information on extruded plastic color measurement, contact HunterLab today.